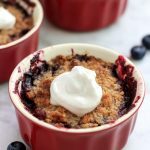 A sweet, but very simple to prepare, gluten-free, Keto Mixed Berry Crumble Pots. 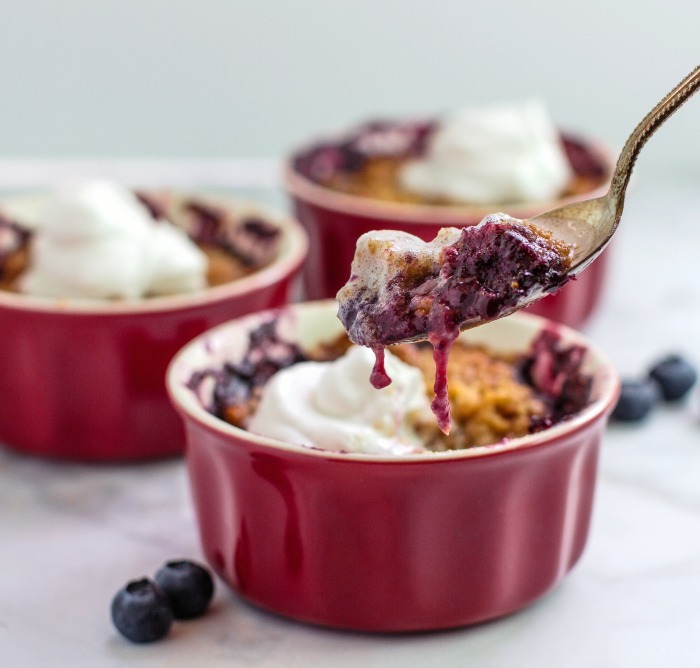 These sweet Keto Mixed Berry Crumble Pots are bursting with sweet berries and are topped with a buttery cinnamon crumble. I make this recipe with fresh berries in the Summer and I use frozen berries in the Winter. 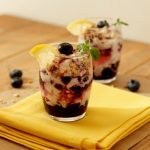 You can use any combination of blueberries, blackberries, raspberries, and strawberries. I used blueberries, blackberries and a few strawberries in mine. 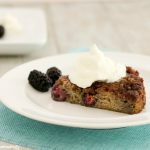 This recipe is excellent served with some unsweetened whipped heavy cream or lightly sweetened with a low carb sweetener or you can also use whipped coconut cream. My favorite is to serve this warmed with a small scoop of low carb vanilla ice cream. If you don’t have the 4-ounce ramekins, then this can also be made in an 8×8 inch baking dish. I just like using the ramekins for better portion control. For recipe and printable recipe card- scroll below photos. Preheat oven to 350 F ( ) and spray six 4-ounce to 6-ounce ramekins with coconut oil non-stick spray. Set aside. In a large mixing bowl add: mixed berries, ⅓ cup Swerve, and xanthan gum. 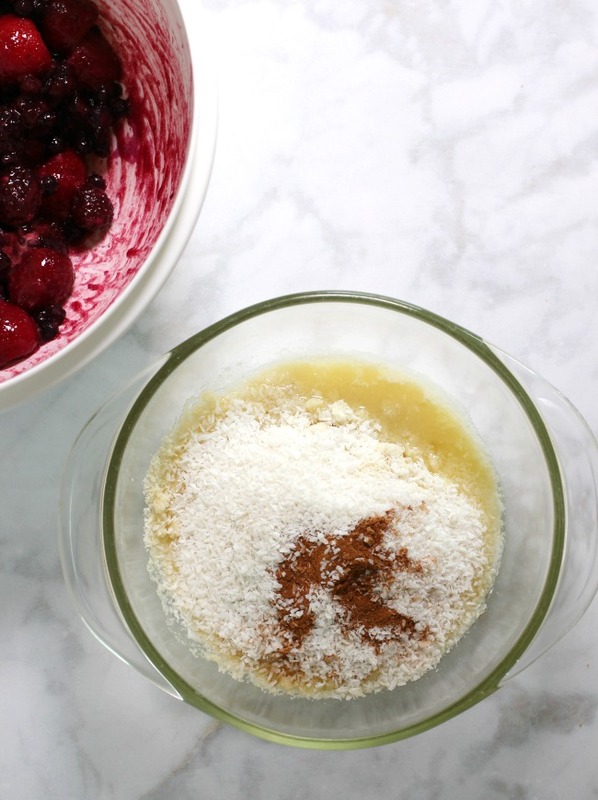 Using a large spoon, gently toss berries to coat with the sweetener and xanthan gum. Set aside. In a large bowl combine: almond flour, ⅓ cup Swerve sweetener, shredded coconut, cinnamon, sea salt and melted butter or coconut oil. Stir and press with a fork until a pasty crumble forms. Set aside. Fill prepared ramekins halfway full with the berry mixture. Top each ramekin with equal amounts of the cinnamon crumble mixture. 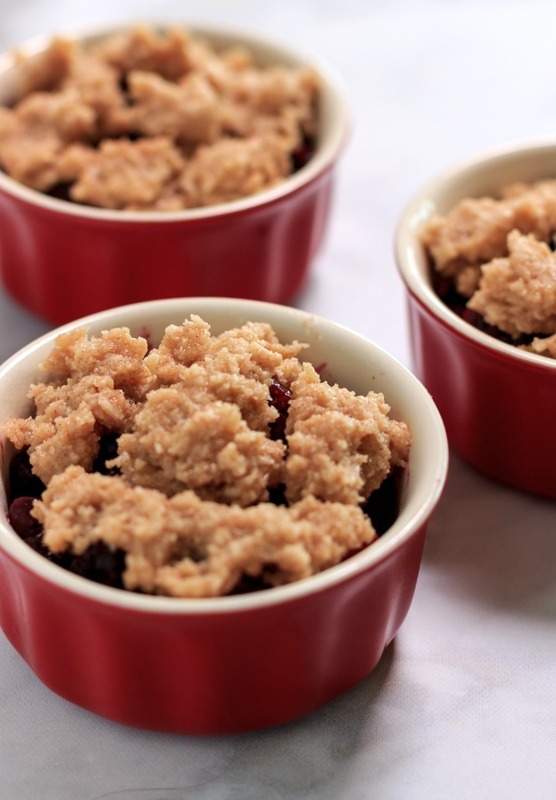 Place ramekins on a large baking sheet and bake for 35 to 40 minutes or until crumble starts browning. Remove and cool for 10 minutes. Serve with sugar-free whipped cream or whipped coconut cream. Preheat oven to 350 F ( ) and spray six 4-ounce ramekins with coconut oil non-stick spray. Set aside. I made this in a casserole and doubled the recipe. The family loved it and didn’t even know it was Keto friendly. Thank you, Cindy, for making the recipe and sharing your kinhttps://beautyandthefoodie.com/wp-admin/edit-comments.php#comments-formd words. I do make in a casserole dish sometime as well. What if you do not have ramicans? You can make this also in a larger ceramic dish, cake pan or glass bowl that fits in the Instant Pot, instead of individual ramekins. Can I use gelatine instead of xanthum gum to thicken? Yes, Heather, you can use gelatin or chia seed gel. I have not tried it this recipe but I have used it in fruit pie recipes before. Can you substitute cornstarch for the Xanathan Gum? And how much would I use the same amount or do I have to add more? Thanks. Allison, If using cornstarch, you would need more. Maybe start with a 1/2 tbsp mixed with 1 tbsp cold water. Just be aware that cornstarch is not low carb and does add carbs to the recipe if you are counting carbs. Thanks. LOL Wish i’d remembered that I posed the question before I started to make the dish. I googled it and it was suggested a 1:1 ratio. It’s baking now so I’ll let you know how it turns out! 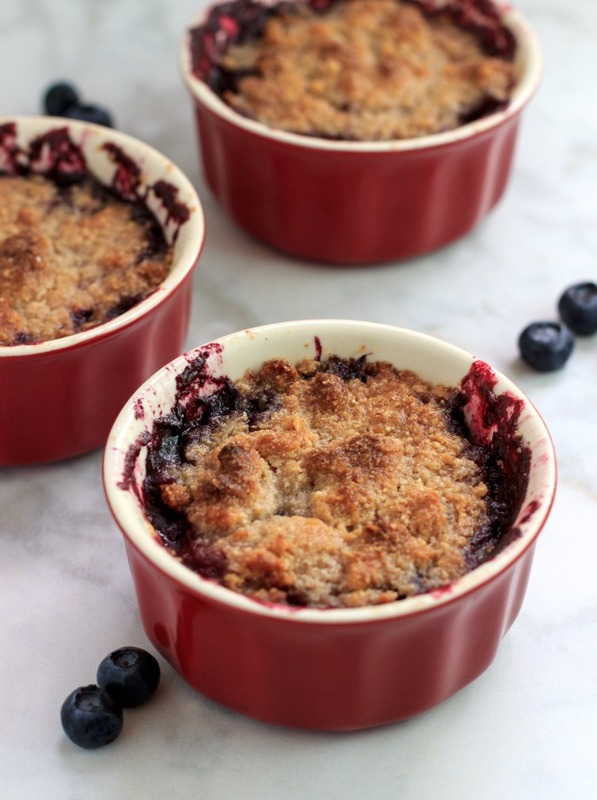 These look so delicious and perfect for all the berries in season right now! Looks so yummy but I do not like coconut..is there a substitute, or just leave it out, or use a bit more almond flour? Yes, Marcia, you can omit the coconut and just a tiny bit more almond flour. This is an incredible recipe Stacey! 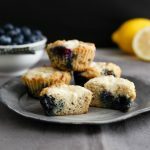 I love the combination of blueberries and blackberries, this makes for the perfect dessert anytime! This looks so tasty! I look forward to trying this. 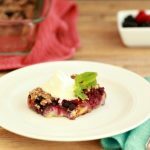 Love the recipe especially it’s Keto berry crumbles ! I can have this dish from AM to PM ! Linda, I haven’t tried freezing them, but I have heard that you can make & bake ahead of time and freeze. I would use a shorter baking time in advance since it will be baked again after defrosting. This is what dreams are made of! Keto heaven! Oh, that’s a great idea to use xanthan gum as the thickener! Thanks for another delicious recipe! I was surprised how well it worked at thickening the berry liquid! berry perfection! I have been craving a crisp…this is happening! 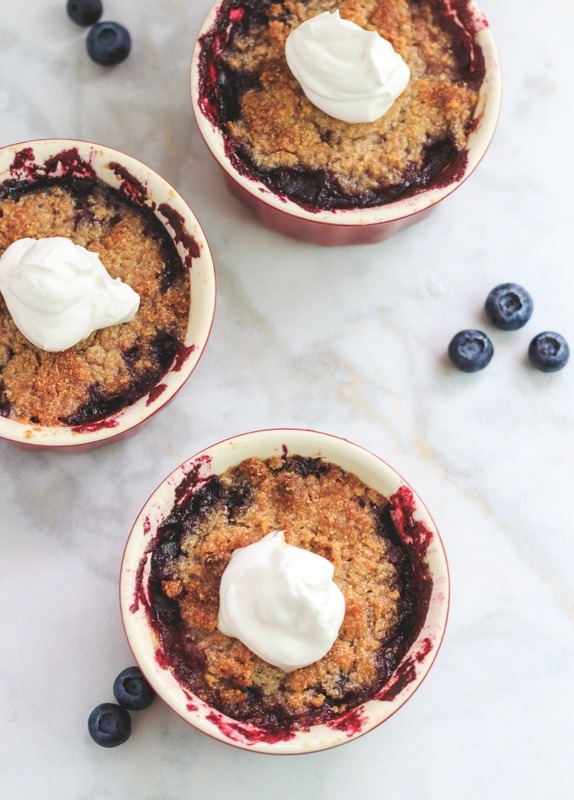 These look so perfect for all the fresh berries right now! So pretty and delicious! Yes please! I would happily enjoy these with a scoop of homemade ice cream on top. Such a special treat! Drooling! 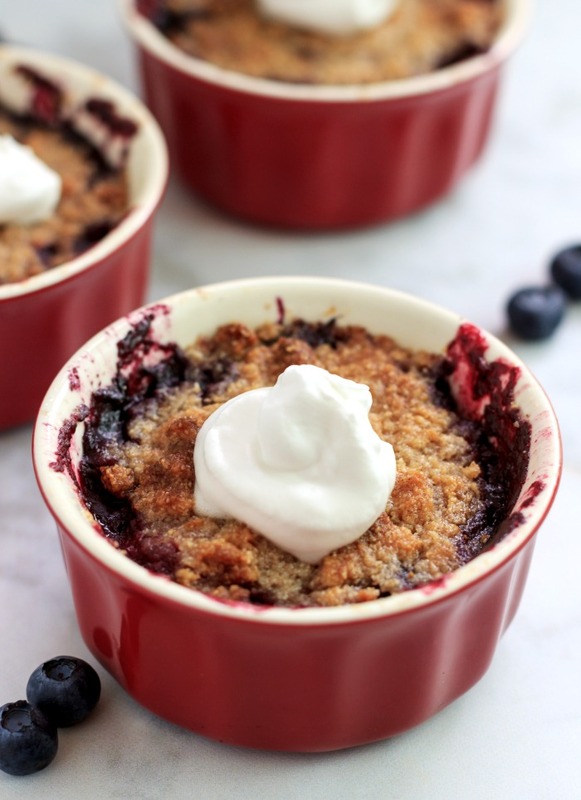 That yummy berry filling with that cinnamon crumble sounds divine. So many summer berries right now, and this is KETO???? Ah-maz-ing. Excited to give it a go! These are PERFECT for summer berry season. Blackberries will be ready in a few weeks here in Northern California. I need to make these little beauties. YUM! !